When the chief (at the time, chief-in-training) took a close up look at the then-new 2007 Chevy Silverado, the major improvements made in the areas of ride-and-handling, body control and interior design were fairly evident. We got to wondering, given the Silverado is now competing against the new Tundra and two new domestic competitors in the form of the 2009 Dodge Ram and 2009 Ford F-150, does the truck which debuted in 2006 still stack up? Well, a new engine and a six-speed transmission mean the 2009 Silverado comes to the table with a whole new set of bragging rights. Before 2009 the 6.2-liter V8 with 403 HP, 417 lb-ft of torque and a six-speed auto was only available in the Denali and the Escalade, but the Silverado and its GMC kissing cousin, the 2009 Sierra, both get to dine at the big boys' table this year. Mated to the fully-boxed frame, choice of three different cabins and three available bed sizes, the truck offers a lot of variability. Of course a smaller V6 and a pair of smaller V8s can be had, but why? The biggest V8 burbles beneath the Silverado's hood gloriously; under load it sounds like something between cherry bomb mufflers and a factory-installed Corsa exhaust. It's not just the sound though: the bite behind the bark is a force to be reckoned with. Coupled with the 3.42 rear axle and the standard six-speed automatic, the truck pulls like a Clydesdale. The new powertrain puts the Silverado right back on top of the game, running quick strip times and hauling our test trailer without even breaking a sweat. Chevys have always been known as workhorse trucks happy to take abuse, but up until this latest redesign, they'd also been known for terrible interiors. While nobody will mistake the new Silverado interior for a Lexus, even two years in it still has a purposeful appeal we can appreciate. The seats are comfortable, all the controls fall easily to hand and the buttons feel solid. The cabin does what it's designed to do and nothing more. Plastics are high quality and fit and finish is solid, but again, this is definitely a truck designed for work, not for toting your golf bags to the country club. Absent are macho overtones beating you over the head with their rugged product design, which is refreshing in the modern truck market. 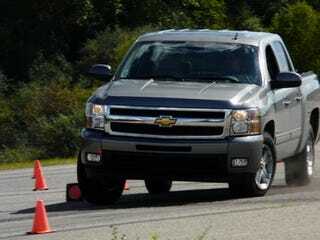 On a road course, the Chevy rides and handles like a truck — surprise! Bouncy but not uncomfortable, smooth over bumps and heaves thanks to the long wheelbase while a bit top-heavy around corners. Riding on big Bridgestone Dueler A/T's doesn't exactly help the track performance, but you get a surprising amount of grip from the blocky tread pattern, even if they're protesting the unfair treatment the whole time. Normal and trailer braking are strong but panic braking feels extra panicky thanks to the frenetic ABS modulation. The truck has a tendency towards oversteer, but a moderate steering ratio, relative light weight for a truck, and deft control via the traction control button makes things far more entertaining on the tarmac than you'd think. The one area in which the Silverado is showing its age is in the race for crazy storage options. It's got a nice roomy bed with a standard bed mat, but the rail clamps don't move around without tools unless you spec up to the optional cargo management system ( a very cool option to super size up to), and there are no stash boxes under the floor or in the center console. The rear seats still win in the easy-to-fold-up category, as there isn't even a latch involved: just lift the seat bottom and you have a nice, flat load floor. In short, the Silverado is probably the most honest interpretation of the term "truck" on the market right now. It's designed to move stuff, to give you everything you need and no fluff, something worth noting in a market stuffed with gimmicks and gadgets. We're not saying gadgets aren't fun, but to a certain segment of the truck-buying population, they're just extra stuff to break down on the road. For folks looking at a straight-up tough and simple pickup with massive towing power and a well-sorted six-speed auto, the Silverado will more than satisfy.